The amazing diversity of bats, of which there are 10 species native to Ireland, is the focus of a week-long conference at NUI Galway (22nd – 26th August). Over 200 scientists from 40 countries are attending the 10th European Bat Research Symposium where they will dispel myths regarding the blindness of these nocturnal creatures and explain the important role bats play in agriculture. 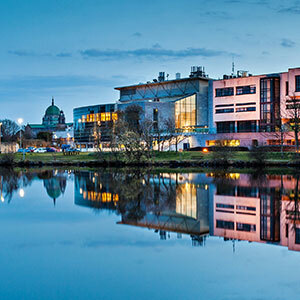 NUI Galway's long involvement in bat research, first initiated by Professor James Fairley in the early 1980s, led to the University being chosen as the venue for the conference's first visit to Ireland. A keynote address delivered by Professor Thomas Kunz, Professor of Biology at Boston University, will focus on the role bats play in controlling agricultural pests. For example, the local bat population of the Brazilian Free Tailed Bat species in south central Texas may exceed 100 million each night. These bats disperse over varied landscapes to feed on flying insects. Some of their prey includes crop pests such as the corn earworm and the cotton hole worm. Dr James Dunne of NUI Galway's Department of Zoology explained how beneficial the creatures are in controlling Ireland's insect population. "The small bat seen first at dusk, weaving around and over trees is the Pipistrelle. This is the most common bat in Ireland and feeds mainly on midges, mosquitoes, caddis flies and crane flies. A pipistrelle may eat 3,000 small insects in a single night. A roost of 100 can account for the annihilation of many millions of harmful insects over a summer," he said. Dr Dunne also put paid to some of the more popular misconceptions about the common bat. "Despite several myths, bats are not blind, they do not entangle themselves in people's hair and the species native to Ireland, do not spread disease." Other areas to be explored throughout the week-long symposium include research which sheds light on the eating habits of bats. Although the vast majority of bats feed on insects, research by scientists in the Basque region has shown that the long-fingered bat is capable of also feeding on free swimming fish by plunging onto the water surface and grasping them with their hind feet. The Lesser Horseshoe Bat is one of Europe's rarer species and is the subject of a number of papers to be delivered at the conference. Sinead Biggane, a researcher with the Department of Zoology at NUI Galway, has been part of a team who have been studying a maternity roost in County Clare for many years. Using radio transmitters, Sinead tracked individual bats to determine their main feeding areas and pattern of feeding. She shows that the bats use mixed woodland, riparian woodland and associated habitats for foraging. They use hedgerows and stone walls to commute to their feeding areas and will not cover large open spaces. This research has important implications for the conservation of bats. The economic boom throughout Europe has resulted in the destruction of many bat inhabited old buildings. The conference will include a special workshop which will deal with the problems associated with this growing trend and also the legal obligations under European law to protect bats and their habitats will be discussed. Reachtálfaidh Acadamh na hOllscolaíochta Gaeilge, acadamh de chuid OÉ Gaillimh, sraith agallamh ar an Aoine, 19 Lúnasa do dhaoine atá ag iarraidh tabhairt faoi chúrsa i scileanna raidió. Beidh na hagallaimh seo ag teacht sna sála ar thorthaí na hArdteiste a fhoilseofar an tseachtain seo. Cúrsa bliana lánaimseartha is ea an Dioplóma i Scileanna Raidió a bheas ar bun in ionad an Acadaimh ar an gCeathrú Rua i gConamara. Is é seo an dara bliain ina bhfuil sé ar siúl. Cuimsíonn sé raon leathan ábhar, ón iriseoireacht go scileanna craoltóireachta, léiriú agus iarléiriú fuaime agus raidió, cúrsaí eitice agus dlí agus scileanna cumarsáide pearsanta. Tá tréimhse taithí oibre ceithre sheachtaine mar chuid den chúrsa. D'oibrigh mic léinn an cúrsa le RTÉ Raidió na Gaeltachta, RTÉ Lyric FM agus BBC Thuaisceart Éireann roimhe seo agus tugadh cuireadh do chuid acu leanúint lena gcuid oibre ann. Dar le roinnt de na mic léinn ar chúrsa na bliana seo, "oscailt súl" ar thionscal na meán ab ea an cúrsa. Tá gné den iriseoireacht chlóite mar chuid de, agus chuir mic léinn na bliana seo caite forlíonadh le chéile a foilsíodh sa nuachtán Foinse. Bhí Pádraig Ó Duithche as Corr na Móna i measc na ndaoine ar an gcéad chúrsa. "Cheap mé, cosúil le go leor daoine, nach raibh tada ann ach a ghabháil chuig an micreafón. Ach tá an t-uafás ag baint leis. D'fhoghlaim mé conas thú féin a chur i láthair agus go gcaithfidh tú tú féin a chur ar an eolas faoin ábhar a bhfuil tú ag caint faoi, má tá tú beo ar an aer ag caint," a dúirt sé. Chaith Cathal Mac Gearailt ceithre sheachtaine ar thaithí oibre le RTÉ Raidió na Gaeltachta i gCiarraí. "Tá mé ag déanamh rudaí difriúla gach aon lá. Tá mé ag déanamh na nuachta, tá mé ag déanamh na bhfógraí agus tá mé ag déanamh na fuaime agus rudaí mar sin," a dúirt sé. Is iad na hiriseoirí Norita Ní Chartúir agus Uinsionn Mac Dubhghaill na príomhtheagascóirí ar an gcúrsa. Tá taithí na mblianta ag Norita Ní Chartúir mar chraoltóir le RTÉ Raidió na Gaeltachta agus tá taithí ag Uinsionn Mac Dubhghaill mar Eagarthóir Gaeilge an Irish Times, agus mar iriseoir le Nuacht TG4 agus le heagrais eile. Cuirtear béim mhór ar scileanna praiticiúla le linn an chúrsa, agus é mar aidhm aige na rannpháirtithe a réiteach chun fostaíocht a bhaint amach in earnáil an raidió, bíodh sin os comhair an mhaidhc mar láithreoir nó taobh thiar den deasc fuaime mar theicneoir nó mar léiritheoir. Tháinig forbairt mhór ar na deiseanna fostaíochta atá ar fáil do dhaoine in earnáil na cumarsáide Gaeilge le blianta beaga anuas. Bíonn éileamh mór ar dhaoine a bhfuil na scileanna cuí craoltóireachta, teicniúla agus fuaime acu, ag eagraíochtaí ar nós RTÉ Raidió na Gaeltachta, stáisiúin raidió eile, TG4, Telegael, Abú Media agus neart comhlachtaí eile. Ar an iomlán bíonn os cionn 40 stáisiún raidió ag craoladh in Éirinn agus deiseanna éagsúla oibre ar fáil do lucht an chúrsa dá réir. De bharr tacaíocht fhlaithiúil Údarás na Gaeltachta ní bhíonn táille ar an gcúrsa agus íocann an tÚdarás liúntas seachtainiúil do rannpháirtithe. Cuirfear tús leis an Dioplóma i Scileanna Raidió ar an 12 Lúnasa 2005 agus é faoi réir ag Acadamh na hOllscolaíochta Gaeilge ar an gCeathrú Rua, Co. na Gaillimhe. Interviews to allocate the remaining places on a radio skills course, offered by NUI Galway's Irish language institute, Acadamh na hOllscolaíochta Gaeilge, are to be held on Friday, 19th August 2005, following the publication of this year's Leaving Certificate results. 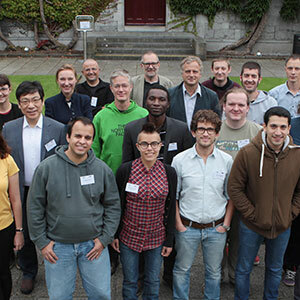 The one-year, full-time Dioplóma i Scileanna Raidió course, now is its second year, is based at the institute's centre in An Cheathrú Rua, Connemara. Covering a broad range of subjects including journalism, broadcast skills, sound production, post-production, ethics, law and communication skills, the course includes a four-week work placement. Previous students have worked at RTE Lyric FM, Raidió na Gaeltachta and BBC Northern Ireland where some have been offered further employment. Described by several students as "an eye opener" to the media industry, the course includes an element of print journalism which last year saw students complete a supplement that was published in Foinse. Pádraig Ó Duithche from Corr na Móna, who was among the first group to study the course. "I thought, like many people, that all that was involved in the course was sitting behind a microphone. I learned that you have to present yourself and you have to inform yourself about the subject that you are going to talk about because you talk live on air," he said. Cathal Mac Gearailt, who completed his work experience with Raidió na Gaeltachta in Kerry, said he would recommend the course to anyone. "I am doing different things every day. One day I will be presenting a programme, the next I will be working the sound desk and doing different things in the studio," he said. Course tutors include Norita Ní Chartúir, an experienced journalist who has worked with Raidió na Gaeltachta, and Uinsionn Mac Dubhghaill, a former Irish language editor of the Irish Times who has also worked as a journalist with Nuacht TG4. With a strong emphasis on practical skills, the course is geared towards preparing participants for a career in radio, either in front of the microphone as a presenter or behind the sound desk as a technician or producer. Opportunities in the Irish language media have expanded greatly in recent years with the advent of TG4 where sound, presentation and technical skills are much in demand. And with over 40 radio stations on air across the country there are several career options available to graduates of the course. Course fees will be paid and participants will receive a weekly training allowance from Údarás na Gaeltachta. The Dioplóma i Scileanna Raidió begins on 12th September 2005 and is offered by Acadamh na hOllscolaíochta Gaeilge in An Cheathrú Rua, Co. na Gaillimhe. Dr Jane Conroy, senior lecturer at the Department of French, NUI Galway, has become the first woman and first native English speaker to be awarded the prestigious Académie Francaise prize for scholarly work in French. Dr Conroy has been honoured with the Grand Prix de la Francophonie de L'Académie Française for her research into intercultural interactions, real and imaginary, between France and other countries, especially Ireland and Britain. This is the first time since its foundation in 1986 that the award, worth €22,500, has been awarded to someone from Ireland, the UK or the US. Dr Conroy was nominated by the French academician Michel Déon, who lives in Galway and was impressed by her pioneering work on 17th century French theatre and literature, written by French travellers to Ireland between the 17th and 19th centuries. During the 17th century, many French plays were set in the UK, a fact that went largely unnoticed until Dr Conroy wrote and published her book in French Tragic Lands: England and Scotland in 17th Century French Tragedy (Gunter Naar, 1999). This award recognises that and other publications by Dr Conroy in French. A native of Rosmuc, Connemara, Dr Conroy is humanities secretary for the Royal Irish Academy and is one of a team of editors of the Irish Journal of French Studies. She will receive her award in a special ceremony at the Institute de France in Paris in December. Dr Conroy is currently in Paris where she is preparing an edition of the 18th century manuscript travel diaries of Charles-Etienne Coquebert de Montbret, written during his time as French consul in Dublin during the reign of Louis XVI. The document will be published in French by the Irish Manuscript Commission but an English version will be made available to university libraries by Dr Conroy. Several of Dr Conroy's colleagues from the Department of French are also spending the summer in Paris where they are conducting research of a very high standard. The relationship with NUI Galway and several of the most respected French institutions in this regard reflects the quality of the research work and the affinity between the two countries. 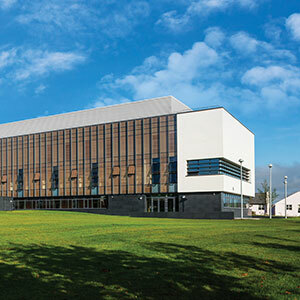 The Huston School of Film & Digital Media, NUI Galway. 29th September-2nd October 2005 In 1996, it was voted the most popular Irish film of all time by Irish Times readers and continues to fascinate people. When it was released on video in 1985, it sold 200,000 copies in Britain alone within four years. The John Ford classic film The Quiet Man continues to fascinate and enthral audiences, making it a cult movie like others such as Gone with the Wind and Ryan's Daughter. However, some people regard it as idealistic, nostalgic and containing more than its fair share of paddywhackery. A modern viewing of The Quiet Man provides much food for thought and from the 29th September – 2 October a conference entitled "New perspectives on The Quiet Man" will be hosted by the Huston School of Film & Digital Media at NUI Galway. The event involves both the analysis of aspects of The Quiet Man as myth, commodity and fetish and the celebration of a film that has sustained such enthusiastic attention and popular appreciation for 50 years. Among the topics considered will be the complexity of the film's relation to Ireland and to John Ford s other films; its perceived place with regard to indigenous Irish cinema; and the phenomenon of its circulation and reception as a cult film over the years. As Rod Stoneman, Director of the Huston School of Film & Digital Media at NUI Galway has remarked: " The Quiet Man is a pivotal film in Irish culture, a film that has achieved cult status long ago and been much debated in recent years. John Ford s classic film offered an image of Ireland that has circulated internationally and still brings many tourists to these shores. It is especially appropriate to be staging the conference amid the locations of the film's original shooting in 1951." Among the contributors to the conference will be some leading international academics, including Professor Luke Gibbons (Keough Family Chair of Irish Studies, University of Notre Dame), Dr. Ruth Barton (University College, Dublin), Dr. Richard C. Allen (University of Sunderland, UK), and Dr. Michael Gillespie (Louise Edna Goeden Professor of English, Marquette University, Wisconsin, USA). Luke Gibbons, the author of a book on the film, will examine The Quiet Man with regard to John Ford's westerns. Ruth Barton argues that we need to read the character of Mary Kate in The Quiet Man against the background of Maureen O Hara as the star of a series of films previous to The Quiet Man that saw her wield a sword, ride horseback across the desert and make love to pirates of dubious reputation, in films such as The Spanish Main and Sinbad the Sailor, and not exclusively as a fantasised representation of Irish femininity. Richard C. Allen, in a paper entitled " 'I've come home, and home I'm gonna stay': The Quiet Man in Irish-American cinematic history," argues that while the film is fictional and stereotypical, it offers some powerful insights into the experience of exile and homecoming. Indeed, as a vehicle for exploring issues such as emigration and exile; landownership; the subordination of women; and the controlling influence of the Catholic Church, Allen argues that this tragic-comedy allows the audience to engage at a high level with the emotional turbulence of the exile's condition. Michael Gillespie will present the provocatively titled paper 'Is Californication a Mortal Sin?' in which he argues that The Quiet Man, despite its being made along conventional Hollywood lines, is an Irish film and as such provides insights into what features legitimately define that category. 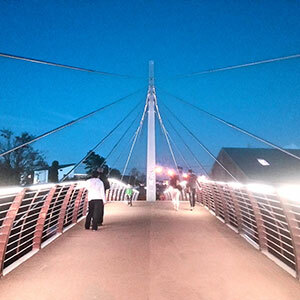 A full programme of conference papers and screenings is available from the Huston School. There will also be screenings of a special 35mm print of The Quiet Man brought in from an archive in Los Angeles, and related films and visits to the locations in Connemara where the film was made. The Quiet Man screening, to be held in the Town Hall on Saturday (October 1st) at 4pm, will also be preceded by a Q&A with the acclaimed Irish playwright and screenwriter, Hugh Leonard. The fee for this screening is €6/€4. The conference is one of an ongoing series of events at the Huston School including conferences on 'New Scottish Cinema' on November 4th - 5th and 'Women in the Picture 2' next January. A valuable collection of personal letters and other material belonging to a close friend of Douglas Hyde, An Craobhín Aoibhinn, eminent Gaelic scholar and first President of Ireland, has been presented to NUI Galway. The collection has come from the family of Tom Morrisroe who was born and raised in Ratra, near Frenchpark, Co Roscommon, close to the home of Dr Douglas Hyde. A strong friendship developed between the two men, which lasted throughout their lives, maintained by regular correspondence. The Hyde papers presented include family photographs showing Tom Morrisroe fishing and socialising with the Hyde family, indicating a close social relationship. The Morrisroe-Hyde papers include an extensive collection of letters in Irish from Douglas Hyde, who had taught Irish to Morrisroe, as well as material relating to Hyde's visit to the US to fundraise for the revival of the Irish language. The papers will join Lamhscribhinní de hÍde, 120 manuscripts gathered by Dr Hyde during the course of his folklore studies and other related material already held in the archives of the James Hardiman Library, NUI Galway. Tom Morrisroe joined An Garda Síochána and served in Mayo and later was stationed in Galway as Garda Sergeant until his death in a car accident in 1954. 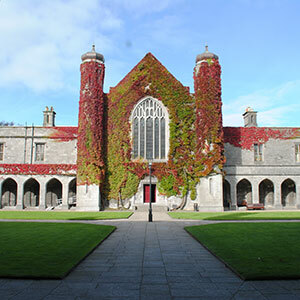 His daughters, Evelyn Morrisroe Connolly and Sr Bernadine (Breege) Morrisroe, were born and spent their early childhood on what is now the NUI Galway campus at Morrisroe House, current home to the University's Department of Philosophy. Evelyn now lives in Westchester, New York and Sr Bernadine is based in the Convent of Mercy, Dunmore, Co Galway. Speaking at the presentation of the Hyde papers to NUI Galway, Evelyn Morrisroe-Connolly said: I am so happy that these precious documents, which have been in my family's possession for more than fifty years have finally found a suitable home in the James Hardiman Library, which is not a stone's throw from where my sister and I played as children. My father and his beloved friend, 'An Craobhín Aoibhinn', enjoyed a life-long friendship which is reflected in the many letters written to my father from both Hyde's home in Frenchpark and Áras an Uachtaráin. Dr Iognáid Ó Muircheartaigh, President of NUI Galway said: The presentation of the Morrisroe-Hyde papers renews the long-standing relationship of the Morrisroe family with NUI Galway. On behalf of the entire University community, I thank the Morrisroe family, and Evelyn Morrisroe Connolly in particular, for presenting these important Hyde papers to the James Hardiman Library. This donation will substantially enrich our Library's holdings relating to Douglas Hyde and the early years of the Irish language revival. Marie Reddan, Librarian, James Hardiman Library, NUI Galway said; We are delighted to receive this significant collection of historical correspondence which will complement existing material, including manuscripts the Library holds relating to Douglas Hyde. The Morrisroe-Hyde papers are an important primary resource for research into the social, cultural and political history of Ireland in the late nineteenth century. Tá bailiúchán litreacha pearsanta agus ábhar eile le dlúthchara le Dubhghlas de hÍde, An Craobhín Aoibhinn, scoláire Gaeilge mór le rá agus céad Uachtarán na hÉireann, bronnta ar OÉ, Gaillimh. Ó theaghlach Tom Morrisroe, a rugadh agus a tógadh i Ratra, gar do Dhún Gar, Co. Ros Comáin, in aice le baile an Dr Dubhghlas de hÍde a tháinig an bailiúchán. Bhí dlúthchairdeas idir an bheirt ar feadh a saoil agus bhídís i dteagmháil lena chéile go rialta. I measc pháipéir de hÍde a bronnadh tá grianghraif de Tom Morrisroe agus é ag iascach agus ag sóisialú le teaghlach de hÍde, rud a léiríonn an dlúthchairdeas a bhí eatarthu. I measc pháipéirí Morrisroe-de hÍde tá bailiúchán nach beag litreacha Gaeilge ó Dhubhghlas de hÍde, a mhúin an Ghaeilge do Morrisroe, mar aon le hábhair eile a bhaineann le cuairt de hÍde ar Stáit Aontaithe Mheiriceá agus é i mbun feachtas bailithe airgid d athbheochan na Gaeilge. Beidh na páipéir mar chuid de bhailiúchán lámhscríbhinní agus ábhar eile le de hÍde atá i gcartlann Leabharlann Shéamais Uí Argadáin, OÉ, Gaillimh, cheana féin. Bhí Tom Morrisroe ina Gharda Síochána i Maigh Eo agus ina Sháirsint i nGaillimh go dtí gur cailleadh i dtimpiste cairr i 1954 é. Rugadh a iníonacha, Evelyn Morrisroe Connolly agus Sr Bernadine (Breege) Morrisroe, agus chaith siad cuid mhaith dá n-óige san áit a bhfuil campas OÉ, Gaillimh lonnaithe anois. Roinn Fealsúnachta na hOllscoile atá i dTeach Morrisroe anois. Ag labhairt di ag bronnadh pháipéir de hÍde ar OÉ, Gaillimh, is é a dúirt Evelyn Morrisroe-Connolly: Táim an-sásta go bhfuil baile oiriúnach bainte amach ag na cáipéisí luachmhara seo, atá sa teaghlach seo againne le breis is caoga bliain anois. Níl Leabharlann Shéamais Uí Argadáin ach coiscéim coiligh ón áit a mbíodh mo dheirfiúr agus mé féin ag súgradh le linn ár n-óige. Dlúthchairde ar feadh a saoil ba ea m'athair agus 'An Craobhín Aoibhinn' agus tá sé sin le sonrú sna litreacha a scríodh chuig m'athair le linn do de hÍde a bheith i nDún Gar agus in Áras an Uachtaráin. Dúirt an Dr Iognáid Ó Muircheartaigh, Uachtarán OÉ, Gaillimh, an méid seo: Le bronnadh pháipéir Morrisroe-de hÍde tá athnuachan á déanamh ar an gcaidreamh fada atá ag teaghlach Morrisroe le hOÉ, Gaillimh. Thar ceann phobal na hOllscoile ar fad, glabhaim buíochas le teaghlach Morrisroe, agus le Evelyn Morrisroe Connolly go háirithe, as na páipéir thábhachtacha seo de chuid de hÍde a bhronnadh ar Leabharlann Shéamais Uí Argadáin. Cuirfidh an tabhartas seo go mór le saibhreas ábhair na Leabharlainne a bhaineann le Dubhghlas de hÍde agus leis na blianta tosaigh d'athbheochan na Gaeilge. Is é a dúirt Marie Reddan, an Leabharlannaí, Leabharlann Shéamais Uí Argadáin, OÉ, Gaillimh: Is mór an chúis áthais dúinne an bailiúchán tábhachtach seo de chomhfhreagras stairiúil a fháil agus cuirfidh sé go mór leis an ábhar atá againn cheana féin, lena n-áirítear lámhscríbhinní, a bhaineann le Dubhghlas de hÍde. Is foinse bhunaidh thábhachtach iad páipéir Morrisroe-de hÍde do thaighde ar stair shóisialta, chultúir agus pholaitiúil na hÉireann ag deireadh an naoú céad déag. The Faculty of Law at NUI Galway has announced the appointment of Mrs Justice Catherine McGuinness to the position of Adjunct Professor of Law. Mrs. Justice McGuinness is a judge of the Irish Supreme Court and President of the Law Reform Commission. A former senator representing the University of Dublin, Trinity College panel in Seanad Éireann, Mrs McGuinness has also acted as the Chairperson of the Forum for Peace & Reconciliation. Welcoming the appointment, Marie McGonagle, Head of the Law Department and Director of the LL.M in Public Law said: "Given her dynamic track record as both a judge and legislator, it is especially appropriate that Mrs. Justice McGuinness will be associated with our new LL.M programme in Public Law. The students on that programme – which is the first of its kind in Ireland – will have the benefit of her extensive knowledge and experience". The Dean of Law, Donncha O'Connell, said the Faculty was honoured that a person of Mrs. Justice McGuinness's calibre was willing to accept the University's offer of an Adjunct Chair for a three-year period. He added that he looked forward to a fruitful period of engagement between the academic staff and student community in NUI Galway and an eminent member of the Irish judiciary. "This will cement the already healthy relationship between the Faculty and judiciary developed in recent years through the Faculty's involvement in editing and producing the Judicial Studies Institute Journal" he said. The presenter of RTE's Mooney Goes Wild nature programme, Eanna Ní Lamhna, is to deliver a public lecture on sustainable development at the Environmental Change Institute at NUI Galway on Monday 21st November at 8.00pm. The well-known environmentalist is the current president of An Taisce and will deliver her talk on 'A Future for Our Past' at the O'Tuathail Theatre in the Arts Millennium Building. The event is free and members of the public are welcome to attend. An experienced radio and television broadcaster and a fluent Irish speaker, Eanna is in Galway for this year's Science and Technology Festival which runs from the 21st to the 25th November. Her talk will focus on how we can reconcile the growing prosperity in Ireland and the development this brings, with conserving our environmental heritage and countryside. She has been invited by the Director of the Environmental Change Institute, Professor Emer Colleran, to deliver what is the third in a series of topical lectures. "Eanna is a very charismatic speaker and is well-known for her commitment to sustainable development. The Environmental Change Institute is delighted to host her talk", says Prof. Colleran. 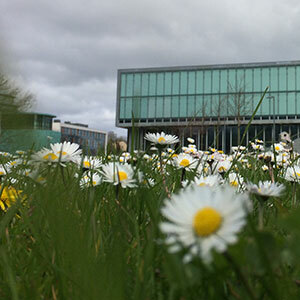 The Environmental Change Institute (ECI) at the National University of Ireland, Galway was founded in September 2000 to develop a fundamental understanding of the processes involved in and the key indicators of, environmental change. It brings together the knowledge, skills and experience of researchers from a wide variety of relevant disciplines. 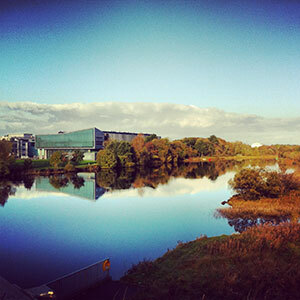 The result is a focused, interdisciplinary and cross-faculty centre at NUI, Galway, dedicated to environmental science and environmental change research.